Real Spider Webs! 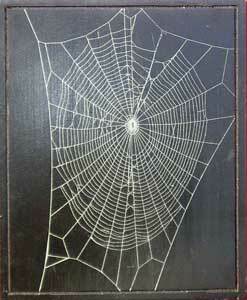 Delicate, silk spider webs mounted on wooden plaques. 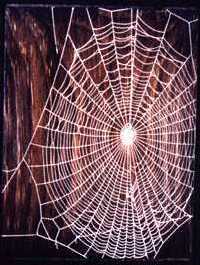 Our spiders hunger for their work and provide us with genuine masterpieces of natural art. Enjoy the beauty of a silky spider web without the spider. Admire the precision and the perfection of the orb weaver, araneidae, preserved and protected as a work of art. Plaques have either a dark walnut or black finish - each one has a real, unique Web individually crafted by our little artisans, and Will, for a one-of-a-kind gift. Reasonably priced at $40 for 7"x9" and $60 for 9"x11" + $15 s/h for orders within the U.S. and Canada. (An additional $2 s/h for each web ordered) U.S. orders sent USPS Priority mail; Canadian orders sent parcel post - 7-10 days. Vermont residents add 6% sales tax. Don't want to order on the Web? You can also order by phone or mail.